When Alnisa Allgood moved to Madison in 1991, she didn’t have much of a plan. She had studied chemical engineering at Penn State University on an Air Force ROTC scholarship, expecting to serve. But then she came out as gay. Discharge papers arrived before active duty called. Allgood hitched a ride to Madison at a friend’s recommendation. She attended a meeting for the 10 Percent Society, a gay student organization, and learned about a years-long struggle to start an LGBT center on campus. 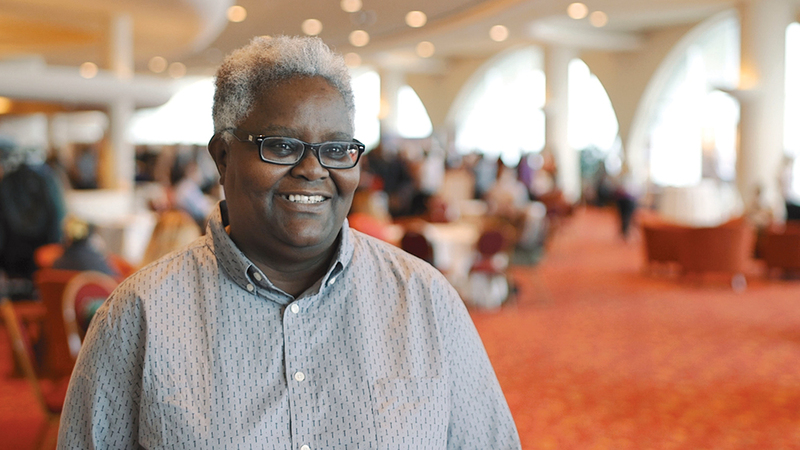 Allgood, now an executive director of two nonprofit organizations in Madison, combined her passion for problem-solving and helping others to open the university’s LGBT center in 1992. Over the years, the center has changed in structure (from a student-run organization to an administrative unit), location (from off campus, to the Memorial Union, to the Red Gym), and name (newly the Gender and Sexuality Campus Center). But its core purpose — to be a space for support and community — remains the same. What inspired you to start the LGBT campus center? The 10 Percent Society and other LGBT organizations were trying to get the LGBT center [started] the same way as the multicultural center — approved by the regents and funded through the [UW] System. I thought that was always a good thing to work toward, but that it could be another 20 years. I had read about other possibilities for funding a center, a mixture between student segregated fees and grants. So that’s what I did. In an oral history with UW Archives, you said, “The first reaction was to go into protest mode as opposed to going into planning mode.” What did you mean by that? Students had been fighting for [regents’ approval] for over 10 years. But just having a campus center would be a win, right? I went to the dean of students [Mary Rouse] and GLEMA, which was the Gay and Lesbian Ethnic Minority Association. I brought them my sketch outline of how it could get up and running. It moved pretty rapidly. What were some of the original services? We started talking to various professors and instructors about including [LGBT materials] into their curriculum. Back then it was important because it was hard to access good materials that had new research — not old theories of homosexuality being a mental illness. We also offered lesbian and gay fiction [in our lending library] so that students and the community could start feeling more comfortable with themselves. Did you receive any public backlash when it opened? When we were going after the student segregated fees, there were people who argued against us [with] things like, ‘Oh, money shouldn’t be spent on that type of sinful lifestyle.’ … We also had blackout blinds because some people were concerned about identity and people looking into the windows and trying to see who was part of the group. So we came up with protocols — you might even tell people to show up before the announced time, so that somebody’s not sitting there waiting to capture pictures. The center seemed ahead of its time in terms of wider inclusivity. Why? There weren’t a lot resources for lesbian and gay students of color. We wanted to make sure that the campus center was not just increasing LGBT visibility, but also [supporting] ethnic minorities and other disenfranchised communities within the LGBT community. With growing acceptance of the LGBT community, does a center serve different needs today? There are still people looking for a safe space to come out, though I would assume that’s drastically reduced. But I think there’s one thing that LGBT centers can still be of service [for]: a connection point — a reflection that there are other people in the world like me, and there are other people who are willing to be our allies in whatever the struggles are.